If you’re looking into taking an African Safaris, you know that the options are endless. Africa covers 11.67 million square miles and hosts a wide variety of different landscapes. You can explore everything from tropical forests to mountains to deserts and sandy beaches, all while viewing spectacular wildlife at every turn. If you’re unsure of where exactly you want your African Safari to take you, you can always contact us, and to make it even easier, we’ve featured a few of the most popular African Safari tours below. 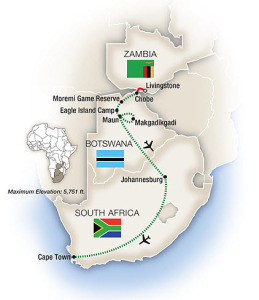 This tour, hosted by Tauck and BBC Earth, combines the best of everything Africa has to offer. It allows guests to experience not only the luxury that usually comes with African Safaris, but also the chance to stay in a remote area and interact with local bushmen, even learning legendary hunting skills. This 12-day safari takes you through Botswana, South Africa, and Zambia to explore some of the world’s most breathtaking scenery and exciting close encounters with the wildlife. This safari takes guests traveling through the bush on a vintage 1920s steam train to view big-game animals like giraffes, elephants, and zebras while sipping cocktails and partaking in an elegant five-course dinner. The next portion of the trip takes guests to view the UNESCO World Heritage site Victoria Falls, the largest sheet of falling water in the world. Visitors also have a chance to get up close and personal with teenage lions at a reserve that raises them to be reintroduced to the wild. One unique part of this tour is the chance to interact at a remote camp with no electrical outlets with local bushman. Guests have the opportunity to learn about life and get an experience far from a commercial tour. To balance out the time spent in the wilderness, this tour also takes guests to cosmopolitan Cape Town, South Africa, where history and contemporary culture blend seamlessly into the environment. Monograms’ private safaris are in themselves unforgettable experiences, but the Kenya Private Safari with Gorilla Trekking really tops the list. Private safaris make the adventure much more personal, and with a local host there to assist your every request, it doesn’t get much better. What makes this safari stand out on the list is two days devoted to gorilla trekking in Bwindi Impenetrable National Park. The park is a UNESCO World Heritage Site and home to almost half of the world’s population of mountain gorillas. While locating the gorillas can take anywhere from a few minutes to a few hours, guests should be prepared for the wet, humid climate of the forests and be physically able to trek through dense vegetation. Once one of the “habituated” family groups is located, guests get to spend up to an hour with them on their private, guided tour. When you think of an African safari you rarely think of penguins and whales. But that’s what you’ll get with African Travel’s Wildlife and Whales Encounter. The tour begins in Cape Town, South Africa, where guests have a few opportunities to climb aboard a cruiseship to watch for Humpback whales, Bottlenose dolphins and Indo-Pacific Humpback dolphins. Guests are even taken to visit a colony of penguins before the tour takes on a more traditional safari itinerary. After exploring the “Fairest Cape” peninsula and the Cape of Good Hope, guests continue on the Safari through the coast of south Africa, where they’ll encounter cheetahs at the Cheetah Outreach and have close encounters with monkeys, birds, and elephants. At the Eastern Cape Game Reserve, guests hop into open-sided safari vehicles and head out to spot big game like elephants, rhinoceros, buffalo, and lions. This tour is ideal for families who want to do more than sit in a safari vehicle and watch. With this safari, guests get to get up-close and personal with wildlife from baboons to giraffes on foot, from the seat of a bicycle, and from an open-topped 4X4. This vacation is unique in that it includes traditional safari itineraries but mixes in hiking, biking, and riding through rugged terrain. It takes guests to unique regions so they get to trek through different types of landscapes. Guests can learn how to track classic African animals on a guided mountain bike tour in remote Mashatu in Botswana, and walk in the tracks of elephants in Sabi Sand Game Reserve in South Africa. This tour is definitely for those who want to explore the African bush in a more active way than traditional safaris. The last safari on our list is also out-of-the-box from what you might consider a traditional safari. Madagascar is earth’s oldest island and has been isolated for 65 million years. It boasts 350 species of frogs, 200 different mammals, and close to 1,000 species of orchids. A Madagascar safari is the perfect opportunity to explore this pristine island and experience nature untouched and rugged. It’s a naturist’s paradise, and International Expeditions tour has gotten nothing but excellent reviews on the itinerary, accommodations, and wildlife expeditions. World Travel Service is proud to partner with each of these tours and is more than happy to help you find the one that fits your needs. If you’re thinking about taking an African Safari, we’ve given you five unique, great examples of some group tours that may fit the bill. If you have any questions about which tour is right for you, don’t hesitate to contact us!